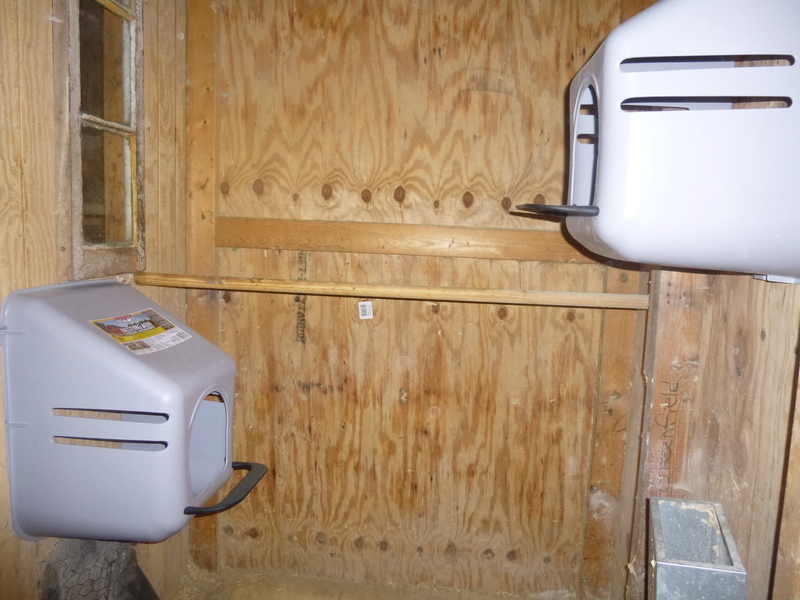 Today I set up two new nesting boxes in Murphy’s area. I am going to move Murphy to the front and Mrs. Brown, Morticia and Milly to the rear front coop. 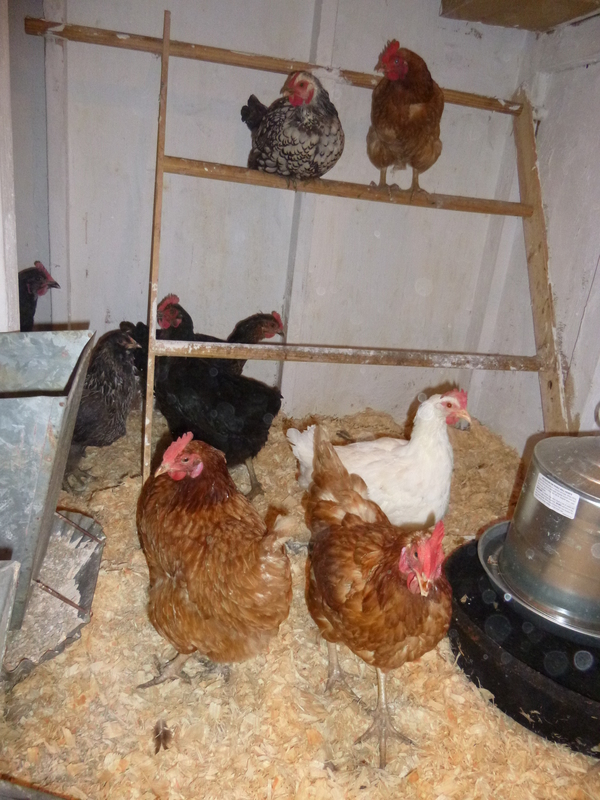 I may move two more from the rear coop in with them too. I will evaluate it tomorrow when I am ready to make the move. I have to put up two more perches and will go to home depot to get what I need for them. I think that I will put Hazel in with Mrs. Brown as they have been together all their lives. This will be better for all. The little Bantams were getting picked on by the bigger birds and I am carefully picking hens that are compatible with them and if Mrs. Brown and Morticia want to sit on eggs again it will be a more serene situation. I am making soup today and have picked more kale out of the garden to put in it. 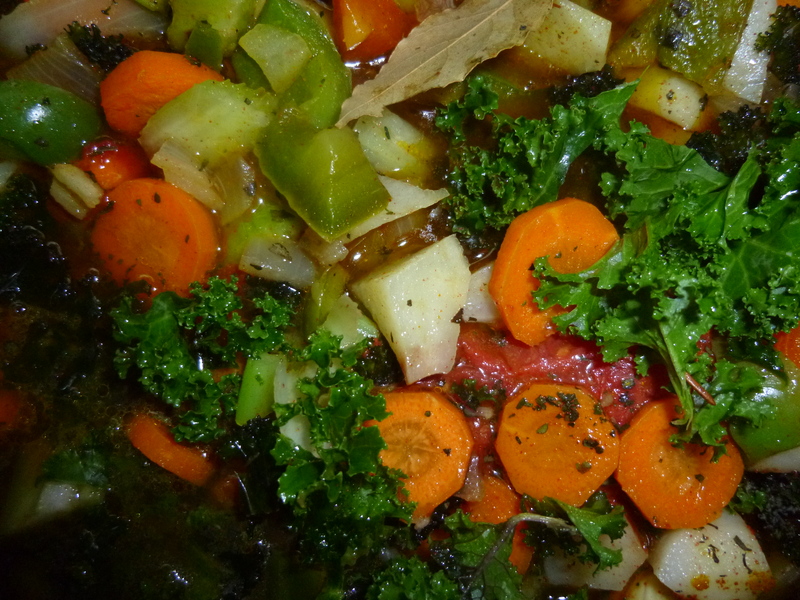 I am planning a trip to Ireland soon and plan to bring the spices I need to make the soup there. When I am in Ireland I generally eat out for the noon meal and eat at the cottage for my evening meal. It’s usually something light like soup. PUMPKINS $1.00 a piece a bargain. 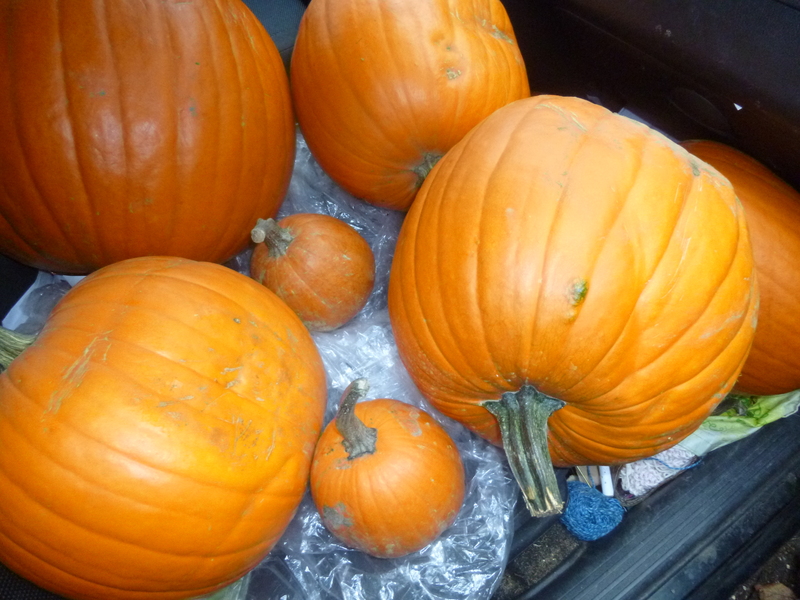 I bought 12 pumpkins – 6 very large ones for the chickens and 6 small ones for pies. I plan to cook them in the crock pot tomorrow. The front seat of my car was full. 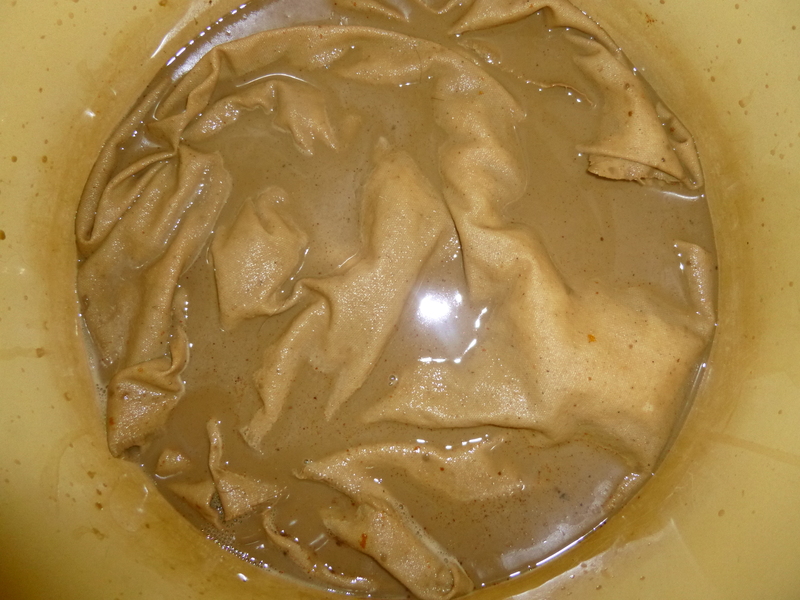 Today I dyed half of the material I bought to make primitive turkey’s with. The dye was so old and was a very light beige so I was unsure it would be suitable. It came out perfect and tonight I will dye the other half. 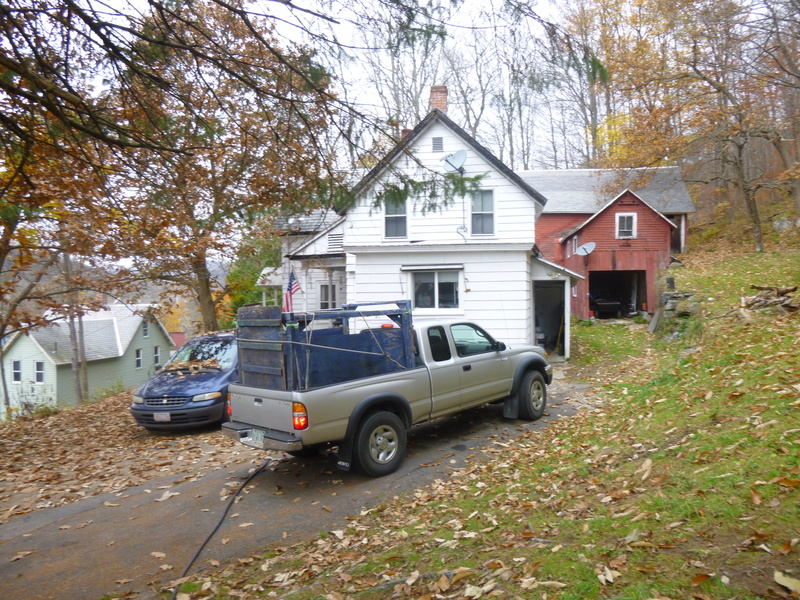 I am hoping to go and get some more black walnuts in Vermont this coming week. Many thanks for reading my blog today and hope you have a wonderful day. We were extremely lucky here, although some people in Colrain were out of power for 6 or so hours and lost a few shingles on their roof. Even in Wayland the town my oldest daughter lives in they lost power and had many trees uprooted. The water in the river is up and the canal near my house is full . We are still cleaning up here from Irene. My thoughts and prayers are with all those people who have suffered such huge losses. Here are some tips for hooking your favorite pet. When I was doing the Seamus rug I just couldn’t get it to look like him. I decided to take a picture of him and blow it up and print it, not in color but black and white. It amazed me how much detail came out. And the rug looks like him. 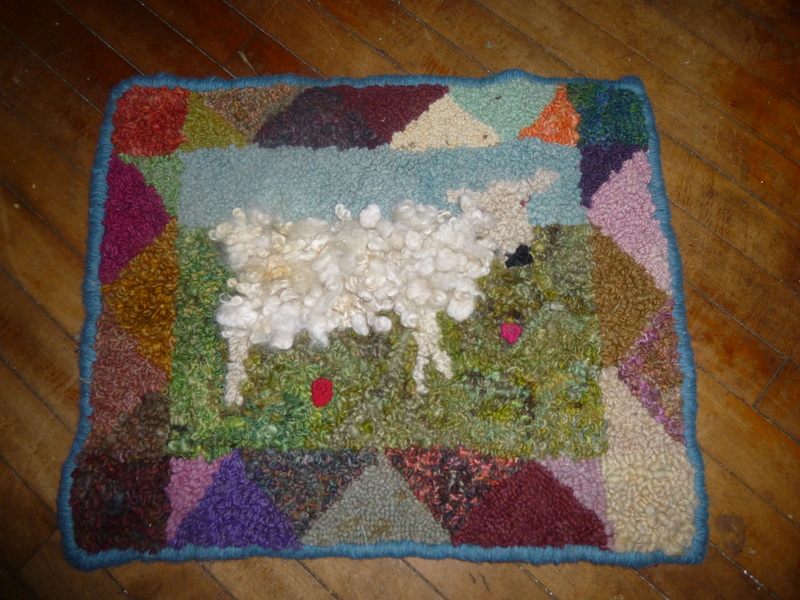 Most of the yarns in the rug are handspun of his beautiful wool and the wool on him was his too. 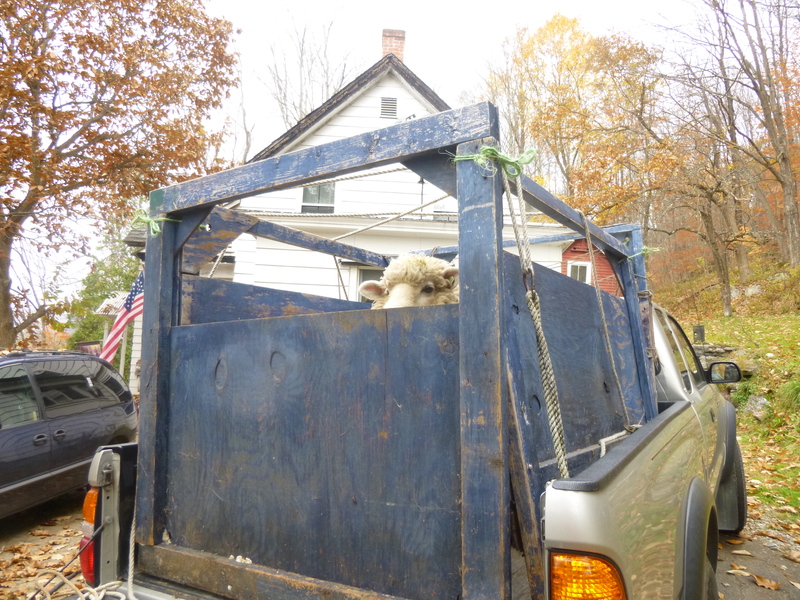 He was a great sheep and I sure do miss him. The second rug is a work in progress and is of Sadie. I drew it so that I could demonstrate hooking with fibers at the July’s hook-in. Right now I have three books going, two were birthday presents and Sheepish I ordered on Amazon. For Lovers of GOD Everywhere by Roger Housden. You might think that this book is only for people deeply religious. You would be wrong. It is full of meaningful poems about life itself. From T.S. Elliot to Saint Catherine of Sienna. I am going to read a little from this book everyday for inspiration. My friend Danielle gave this book to me after I admired it at her office. 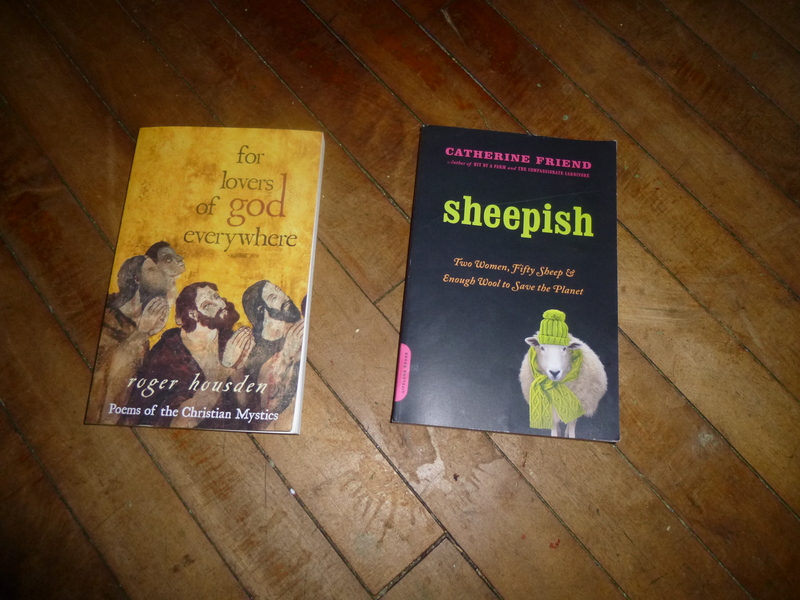 I haven’t started Sheepish by Catherine Friend yet but I am sure it will be amusing. Its says on the cover, Two Woman, Fifty Sheep and Enough Wool to Save the Planet. 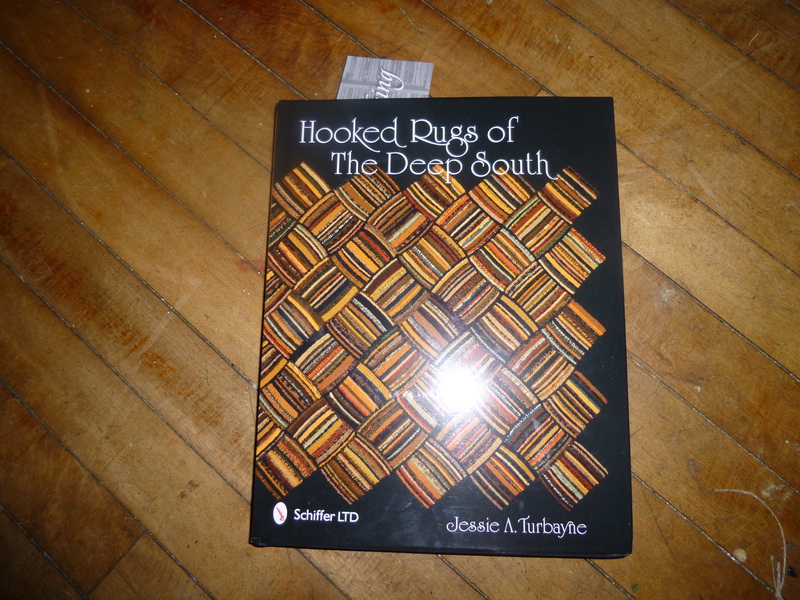 Hooked Rugs of the Deep SOUTH by Jessie A. Turbayne was given to me by my friend Deb. I am enthralled by this book. It is done by states and will take me quite some time to go through the whole book. I am still working on Alabama. Each hooked piece has a little history about it, techniques, colors etc. Some people made many rugs and some made just a few. They are all different. The book is filled with stories about people’s lives, their work, their families and pets. It’s a perfect book. I hope you have a wonderful day and thank you so much for reading my blog. Just as I am getting ready to publish this my son calls with a skunk sighting. He was heading up my hill towards the barn and into my neighbor’s yard. He is huge and the air was tinged with his aroma!!!!!!! So far we have done well with this terrible storm. We have had rain and some wind bursts. I don’t know what tonight will bring and they say this kind of weather will be with us for a few more days. South of here in Ct, NY, Delaware and Maryland they have really gotten hit. They closed a major bridge on Route 95 in Maryland near where some of my family lives because of high winds. 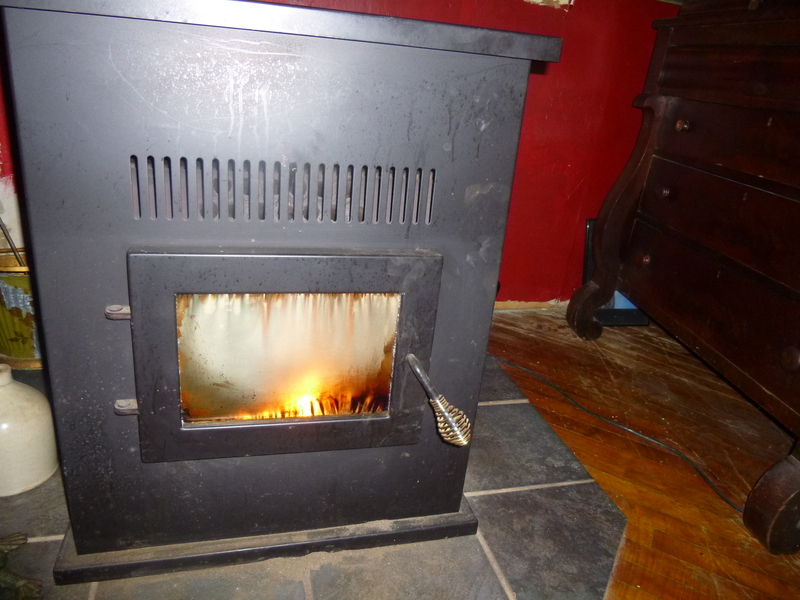 I have got the pellet stove going and will start the wood stove if I have to. The temps are still on the warm side. And people still believe that there is no such thing as global warming. My daughter Cindy called and she lives about 100 miles east of here and she said that the trees were bending with the high winds. The sheep seem to be doing okay during the storm. I know that they can’t wait to be out again. The hens on the east side of the barn spent the morning outside and had their oatmeal. Most of them are just finishing their first moult. When it started raining they came in. The west-facing hen stayed in today they are harder to round-up. That is Hester looking at me with a side-way glance. Her beak was cut too shot when she was a chick. She manages quite well and is very lovable. Hope your day was wonderful and thank you so much for reading my blog. 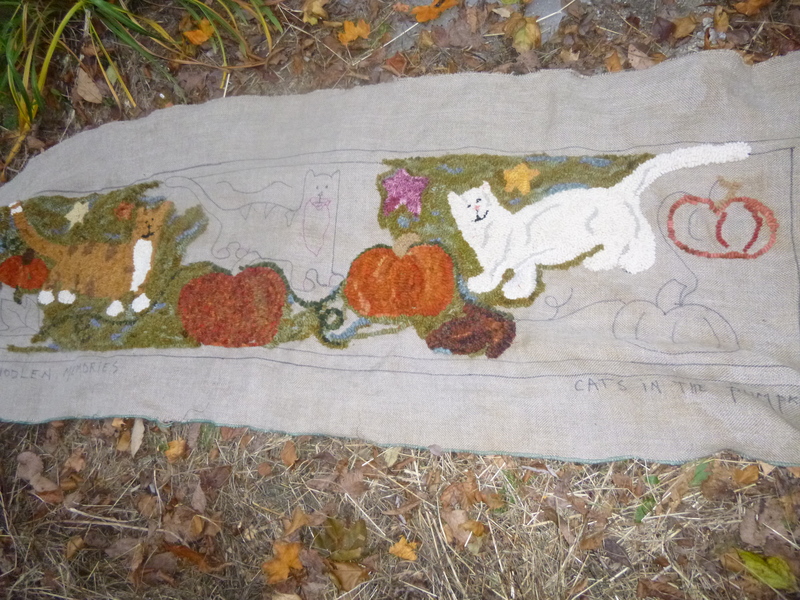 I worked on the Cat and Pumpkin rug the whole time I was at the New York SHeep and Wool Festival. I had many questions about technique and wool. Some people showed me pictures of their rugs. It was fun. So here is where I am at with the rug. I like the lighter pumpkin much better so I plan to pull the darker one out and replace it with the lighter color. And the lighter color was my Uncle Rogers army blanket so the rug will have more meaning to me and my family. I spent a good part of the day getting stuff put away, lawn chairs and the like. I had not even started the fall clean up with the Florida trip and the show. So it was all done in two days. My son came over tonight and fixed the two windows in the barn and helped me get all the animals in the barn till the storm is over. We had opened the two windows for cross ventilation. 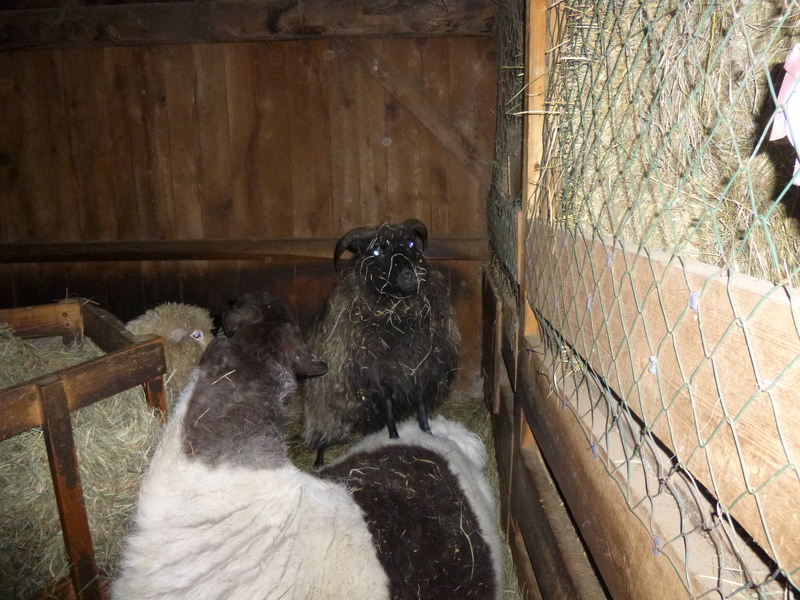 The sheep and llama have been sleeping outside since spring. 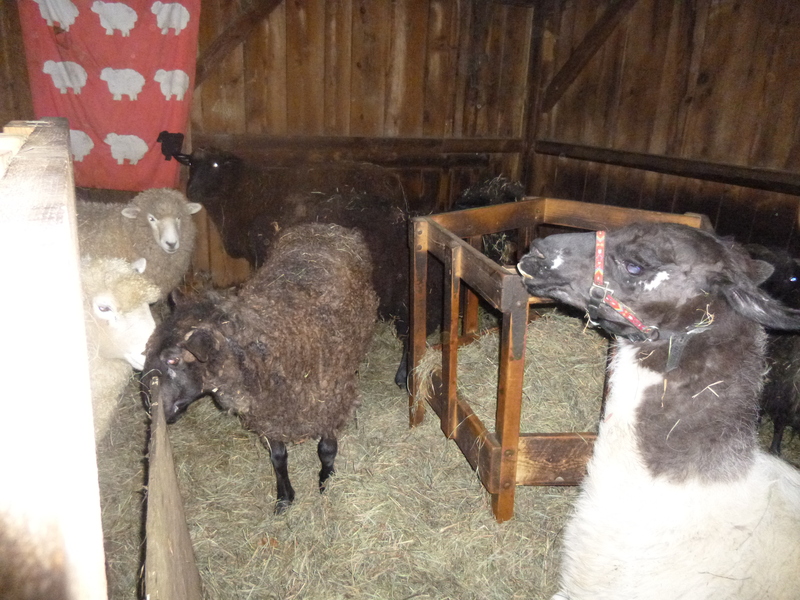 They are all safely in the barn for at least tonight and tomorrow. We will see what the storm brings. My friend Mary Jane of Maryjanesrugs blog fame had a picture of a whimsical antique quilt on her blog today. 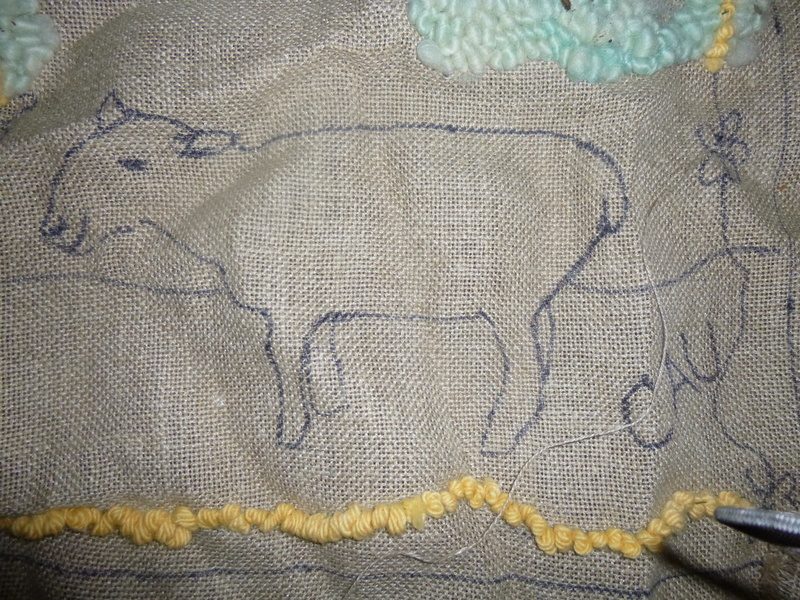 It was delightful with lots of embroidery, bees, hens trees etc. I am thinking of drawing out some of these whimsical animals and plants and put them into a rug. 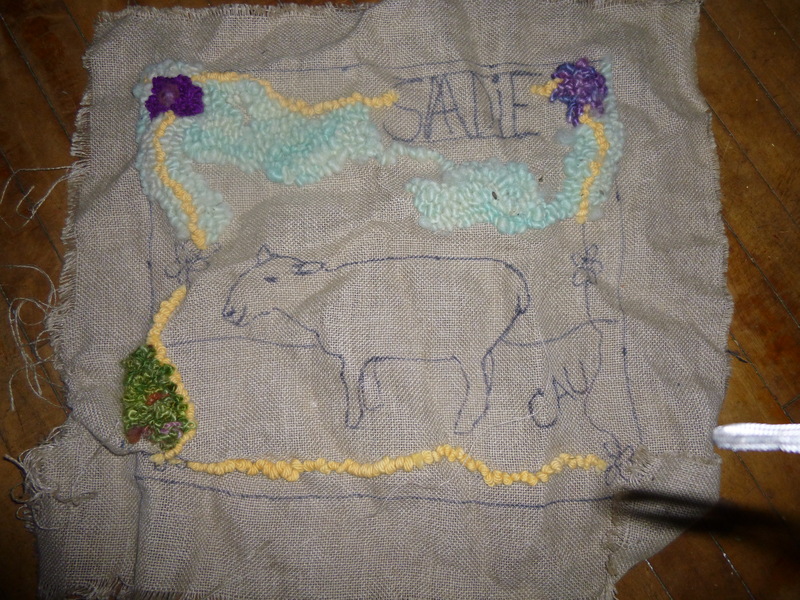 When I am done I will put the pattern on the blog. The day was full of surprises. Cindy and the boys called the first thing this morning , Betty and Jason came up with cupcakes and flowers and other assorted Atkins goodies and my son came over tonight. Today I either heard from or saw all of my children that really makes it a special day. I hope that all of you that are in harm’s way stay safe, many thanks for reading my blog. You just never know how new animals will fit in. The llama is talking and talking. I am sure it’s about the new sheep. He is used to dark sheep so the white ones have thrown him off. 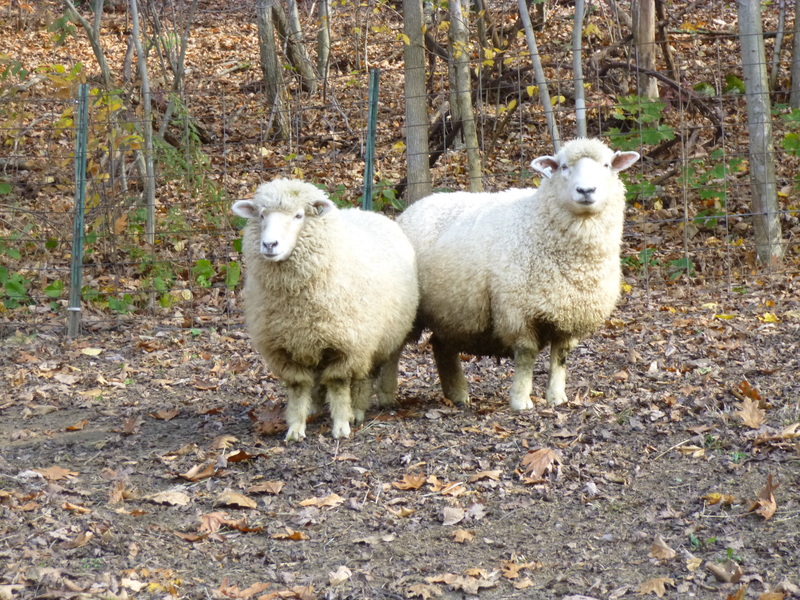 The new sheep are quite delightful, very friendly and are just trying to fit in. I am certainly surprised at Marley. He is such a bully but not this time he stays his distance and just stamps his feet. Soon they will be a group it just takes a little time. One thing for sure the flock is glad that the new girls are not too fond of carrots. That is one thing in their favor. 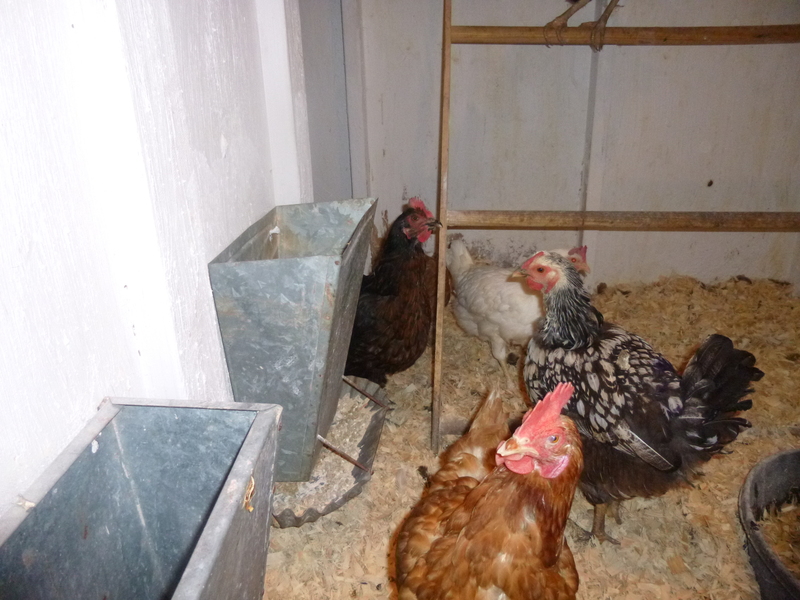 With record winds and lots of rain expected it was time to move the outside hens into the barn. I did a little more whitewashing but didn’t quite finish their coop but it was ready everything clean and inviting. It took about an hour to catch 9 hens. Some were easier than others. Bernice screamed so loud and didn’t stop till I put her in the coop. I will give them Oatmeal tomorrow morning. They will settle in quickly and be safe and warm throughout the storm. 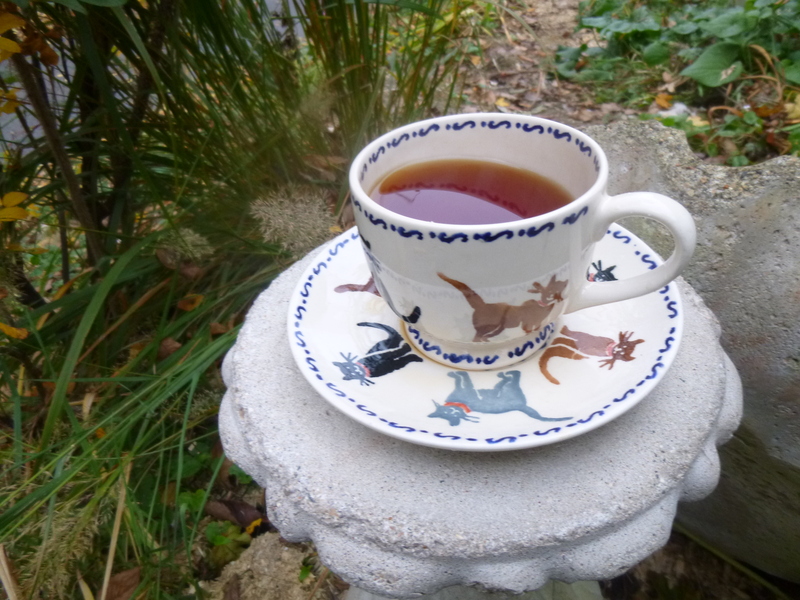 A friend, Louise from my old job gave me this cup and saucer. I love the size and shape of it and immediately went looking for a couple more. But none was to be found. I guess that they stopped making cups and saucers this size. Its a perfect size for a good cup of tea. And I did love the whimsical cats on it. She does some wonderful whimsical patterns and some very modern patterns. I have been busy all day preparing for the storm, I need to cover the windows that I am having replace with plastic before I call it a day. I have a wood stove and gas range so I can cook on both of them and keep the kitchen warm. Its suppose to become much colder and today there was a slight chill in the air. Tomorrow morning I will finish up putting away lawn furniture. Hope your day is wonderful and thank you so much for reading my blog. Hurricane Sandy is heading our way and a storm from Canada is heading our way. Officials are saying that this storm will be worse than Irene, with high winds and heavy rain or snows. No one knows for sure. I was thinking at least we have some sort of warning and can get prepared. A hundred years ago people had no knowledge of a terrible storm coming . We are in a way very lucky to have the warning. Now I am sorry that I didn’t get the battery back-up for the pellet stove. I do think that I should do that before winter snows come. We have been very lucky in my neighborhood and have had little time without power, while other areas of town are without it for weeks. I will be very busy in the next few days battening down the hatches, getting the white-wash done and moving the chickens back to the barn. Barbara Goodchild brought the 2 gals today. A Mother and daughter. They are very well-behaved and walked up to the pasture area with halters. 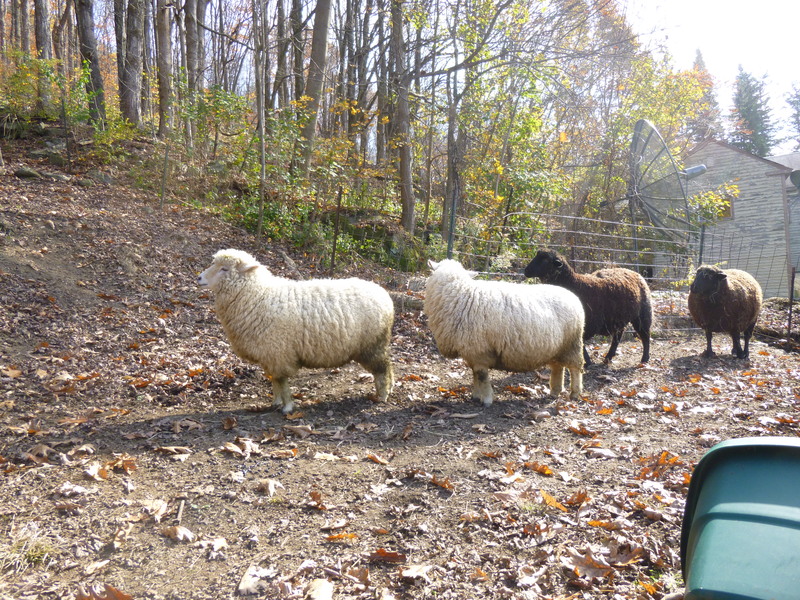 The other sheep came out of the barn to see what was happening. 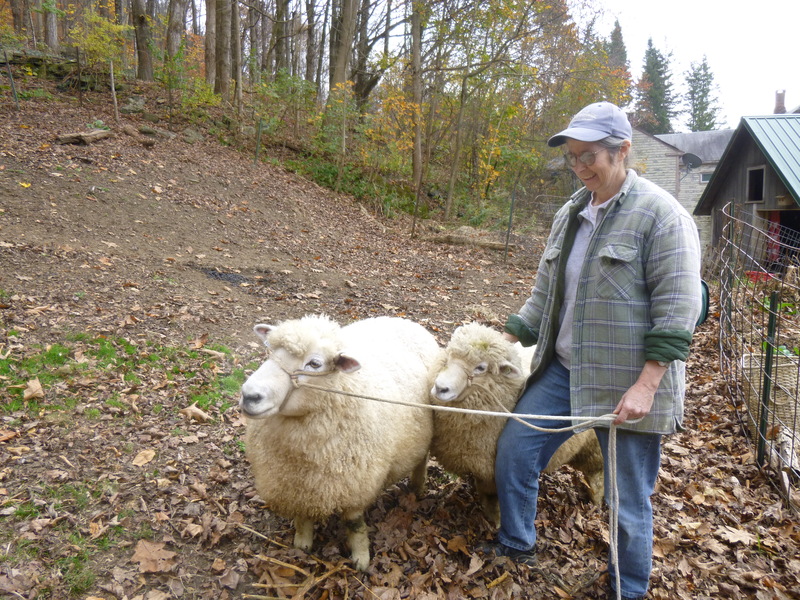 They have never seen white sheep before. It will take about a week for them to get adjusted, today will be the worst day for the new gals getting used to new sheep and surroundings. Of course Elliott was quite shocked, oh no more sheep. He will adjust too. Barbara is saying goodby to the girls. They are pure Romney’s. WHile I was waiting for Barbara I was doing a little cleaning up near the north chickens. The morning-glory vines were so heavy that they had knocked the Herb Bed over. I noticed hundreds of seed pods on them. 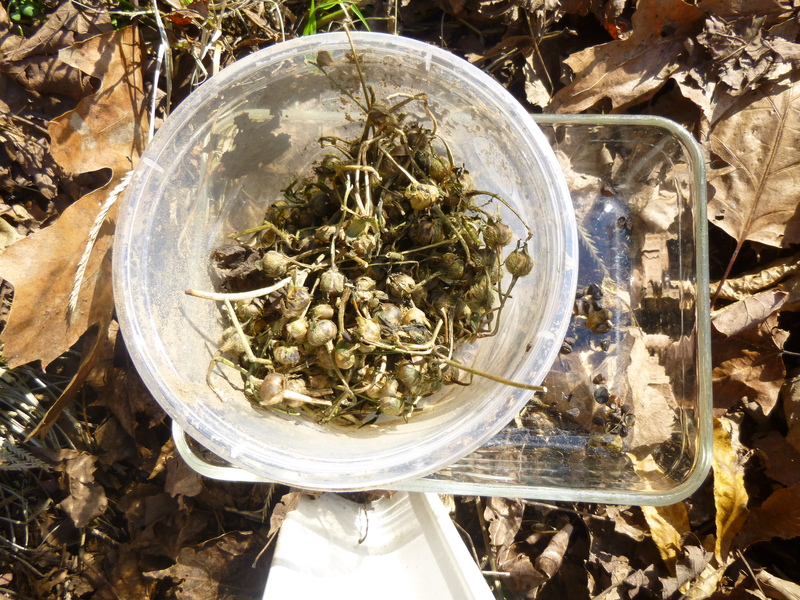 I picked some off and will let them dry naturally and start them early in the spring next year. Hope you have a wonderful day and thank you for reading my blog. 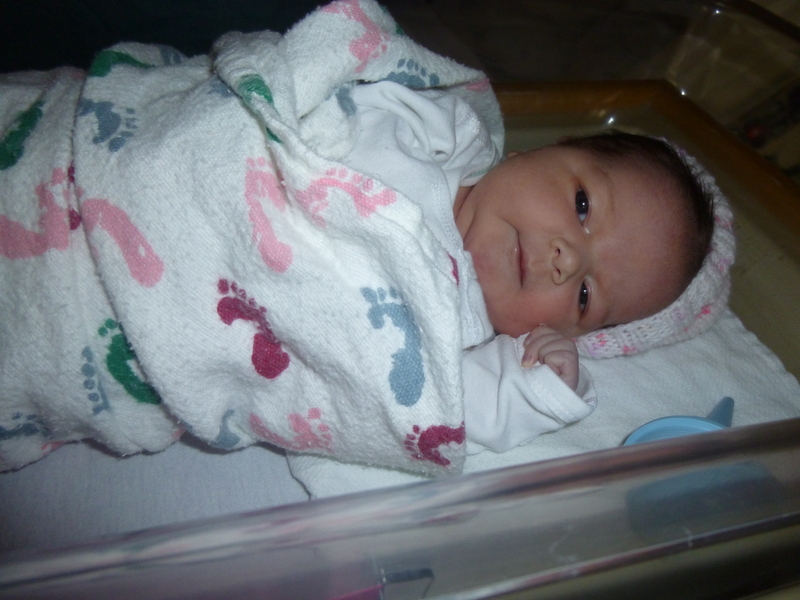 This morning a daughter was born to my son and his girlfriend. Her name is Lil Ann Adams, SHe will be Lilly to me. That will bring the number of grandchildren to 5. 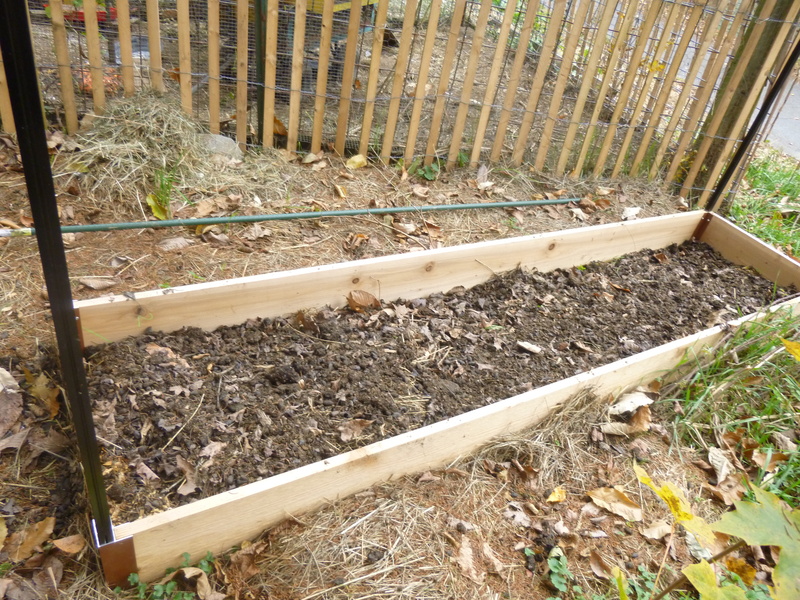 This morning I cleaned up a pile of Llama poop and wheeled it down to the new raspberry bed. The nice thing about llama’s is that they just poop in one place so the clean-up is easy. I added it to the hay from the sheep that I put down earlier in the year. I will now add a layer of mulched hay and that should be it. It will be ready to plant in the spring. I follow a blog about permaculture in Ireland and she mentioned John Seymour. I bought his book “THE SELF SUFFICIENT GARDNER” in the late 70’s/ At the time I was struggling with a garden which used to be a driveway and was full of trap rock. With his guidance I produced lots of great produce and even made maple syrup on a city lot in Holyoke, Mass. All things are possible . 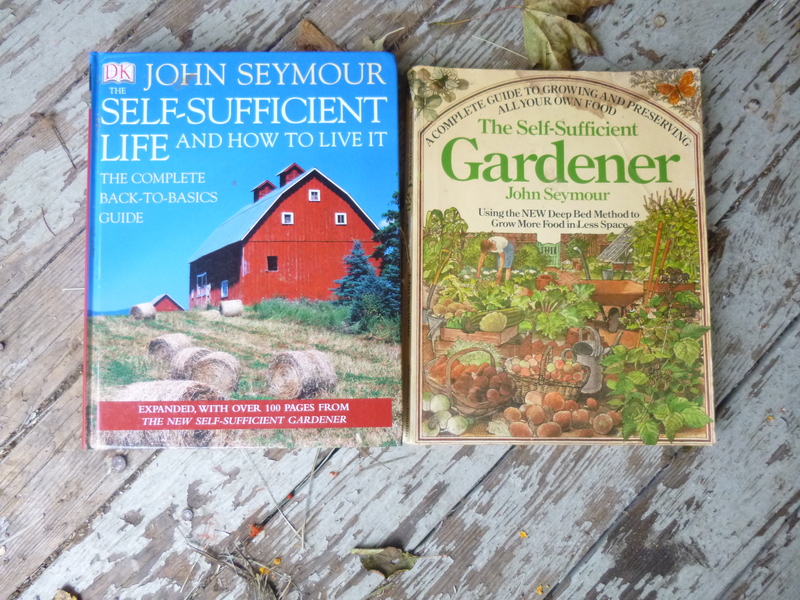 I recently found another book by John called The Self Sufficient Life and was able to get it on Amazon. It too holds many good ideas. 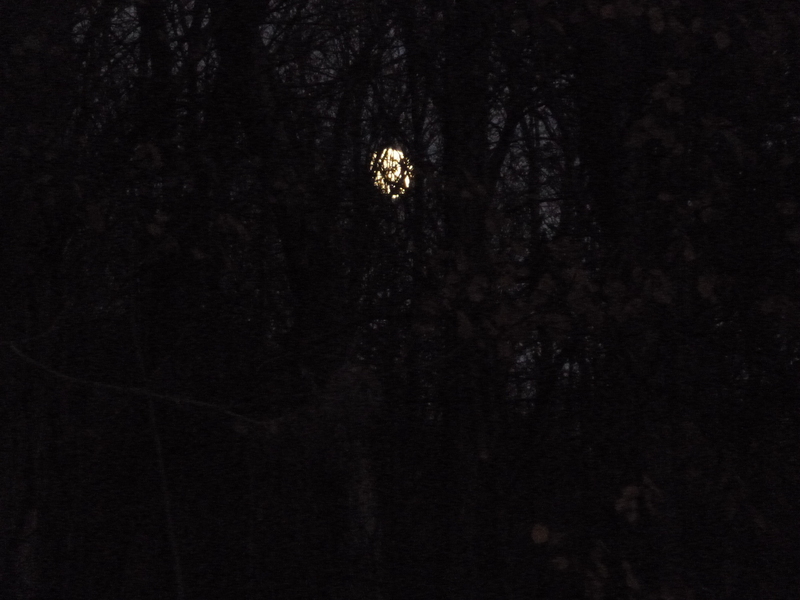 I was out putting the hens to bed and saw the moon just coming over the mountain. I love how it looks amongst the trees. Hope you have a wonderful evening and thank you for reading my blog.